A brig is a sailing vessel with two square-rigged masts. During the Age of Sail, brigs were seen as fast and maneuverable and were used as both naval warships and merchant vessels. They were especially popular in the 18th and early 19th centuries. Brigs fell out of use with the arrival of the steam ship because they required a relatively large crew for their small size and were difficult to sail into the wind. Their rigging differs from that of a brigantine which has a gaff-rigged mainsail, while a brig has a square mainsail with an additional gaff-rigged spanker behind the mainsail. In sailing, a full-rigged brig is a vessel with two square rigged masts (fore and main). The main mast of a brig is the aft one. To improve maneuverability, the mainmast carries a small (gaff rigged) fore-and-aft sail. Brig sails are named after the masts to which they are attached: the mainsail; above that the main topsail; above that the main topgallant sail; and occasionally a very small sail, called the royal, is above that. Behind the main sail there is a small fore-and-aft sail called the spanker or boom mainsail (it is somewhat similar to the main sail of a schooner). On the foremast is a similar sail, called the trysail. Attached to the respective yards of square-rigged ships are smaller spars, which can be extended, thus lengthening the yard, thus receiving an additional sailing wing on each side. These are called studding sails, and are used with fair and light wind only. The wings are named after the sails to which they are fastened, i.e. the main studding sails, main top studding sails, and the main top gallant studding sails, etc. The brig's foremast is smaller than the main mast. The fore mast holds a fore sail, fore top sail, fore top gallant sail, and fore royal. Between the fore mast and the bowsprit are the fore staysail, jib, and flying jib. All the yards are manipulated by a complicated arrangement of cordage named the running rigging. This is opposed to the standing rigging which is fixed, and keeps mast and other objects rigid. A brig is "generally built on a larger scale than a schooner, and may approach the magnitude of a full-sized, three-masted ship." Brigs vary in length between 75 and 165 ft (23 and 50 m) with tonnages up to 480. A notable exception being the famous designer Colin Mudie's 'Little Brigs' (TS Bob Allen and TS Caroline Allen), which are only 10m long and weigh only 8 tonnes. 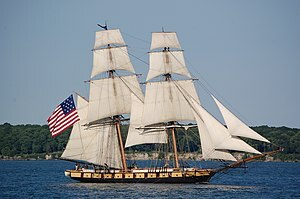 Historically, most brigs were made of wood, although some later brigs were built with hulls and masts of steel or iron. A brig made of pine in the 19th century was designed to last for about twenty years (many lasted longer). The word "brig" has been used in the past as an abbreviation of brigantine (which is the name for a two-masted vessel with foremast fully square rigged and her mainmast rigged with both a fore-and-aft mainsail, square topsails and possibly topgallant sails). The brig actually developed as a variant of the brigantine. Re-rigging a brigantine with two square-rigged masts instead of one gave it greater sailing power. 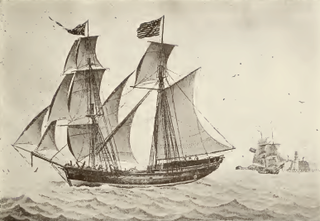 The square-rigged brig's advantage over the fore-and-aft rigged brigantine was "that the sails, being smaller and more numerous, are more easily managed, and require fewer men or 'hands' to work them." The variant was so popular that the term "brig" came to exclusively signify a ship with this type of rigging. By the 17th century the British Royal Navy defined "brig" as having two square rigged masts. Brigs were used as small warships carrying about 10 to 18 guns. Due to their speed and maneuverability they were popular among pirates (though they were rare among American and Caribbean pirates). While their use stretches back before the 17th century, one of the most famous periods for the brig was during the 19th century when they were involved in famous naval battles such as the Battle of Lake Erie. In the early 19th century the brig was a standard cargo ship. It was seen as "fast and well sailing", but required a large crew to handle its rigging. While brigs could not sail into the wind as easily as fore-and-aft–rigged vessels such as schooners, a trait that is common to all square-rigged ships, a skilled brig captain could "manoeuvre it with ease and elegance; a brig could for instance turn around almost on the spot". A brig's square-rig also had the advantage over a fore-and-aft–rigged vessel when travelling offshore, in the trade winds, where vessels sailed down wind for extended distances and where "the danger of a sudden jibe was the large schooner-captain's nightmare". This trait later led to the evolution of the barquentine. The need for large crews in relation to their relatively small size led to the decline of the production of brigs. 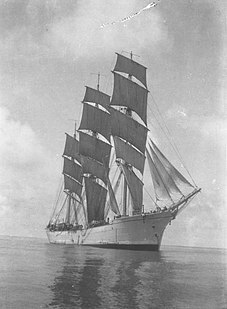 They were replaced in commercial traffic by gaffsail schooners (which needed fewer personnel) and steam boats (which did not have the windward performance problems of square rigged ships). Painting of the brig USS Niagara in the 1813 Battle of Lake Erie. HMS Pilot, a Cruizer-class brig-sloop launched in 1807. While commanded by John Toup Nicholas off southern Italy in 1810-1812, Pilot participated in the capture or destruction of over 130 enemy vessels. In 1815 she fought the last naval engagement of the Napoleonic Wars, fighting to a draw the French frigate Légère. USS Argus used during the First Barbary War and the War of 1812. Archer, a vessel of the Second Texas Navy. 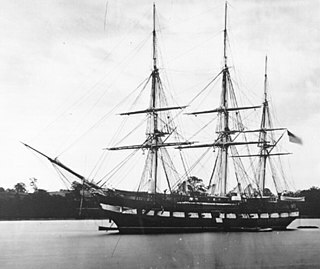 USS Oneida used during the War of 1812. James Fenimore Cooper was a midshipman aboard the Oneida while under construction. The cargo-hauling brig Farmer owned by George Washington. Leonora of Captain Bully Hayes. Mercury (Russian: Меркурий) An 1819 Russian navy 18 gun brig painted twice by Ivan Aivazovsky. On May 14, 1829 Mercury engaged in an uneven battle against 2 Turkish ships of the line, Selimiye (110 guns) and Real-Bei (74 guns) and emerged victorious from that battle, damaging both Turkish sufficiently to be not able to chase Mercury and disengaging the battle. USS Niagara captained by commander Oliver Hazard Perry in the Battle of Lake Erie, a pivotal victory for the United States in the War of 1812. USS Oregon, used in the U.S. Exploring Expedition. Rebecca, captained by Robert Jenkins, whose boarding triggered the War of Jenkins' Ear. USS Reprisal, fought in the American Revolution. USS Somers, sunk in the Mexican–American War. HMS Beagle was built as a brig in 1820 for the Royal Navy. She was deployed as a survey vessel to survey the coasts of South America, Australia, and Africa. A mizzen mast was added prior to the 5-year voyage with Charles Darwin to increase manoeuvrability in the shallow coastal waters that she would explore. HMS Badger, the future Admiral Horatio Nelson's first command as a young lieutenant. Wharton, one of the vessels of the Second Texas Navy, which participated in the Naval Battle of Campeche, which is the only historical example of a steam navy having been defeated by a sail navy. Joel Root as supercargo sailed out of New Haven harbor in 1802 on the brig Huron to begin his journey around the world on a sealing expedition. NMS Mircea was a brig of the Romanian Navy, built in London in 1882 and sunk by aircraft in April 1944. The famous mystery ship Mary Celeste, while sometimes called a brig, was clearly a brigantine. Arkham in H. P. Lovecraft's At the Mountains of Madness. Aquila in the game Assassin's Creed III. Beneficence in Gary R. Bush's "Sail Into Treachery"
Blue Bird in Evert Taube's song "Balladen om briggen Blue Bird av Hull". Constanzia from Jules Verne's A Drama in Mexico. Covenant in Robert Louis Stevenson's Kidnapped (novel). Duncan from Jules Verne's In Search of the Castaways. Enterprise in the film Star Trek Generations (portrayed by the brig Lady Washington). Forward from Jules Verne's The Adventures of Captain Hatteras. Grampus in Edgar Allan Poe's novel The Narrative of Arthur Gordon Pym of Nantucket. Hellebore in the Nathaniel Drinkwater series by Richard Woodman. HMS Wolverine in L.A. Meyer's Under the Jolly Roger. Interceptor in the film Pirates of the Caribbean: The Curse of the Black Pearl (portrayed by the brig Lady Washington). Isle of Skye in Iain Lawrence's The Wreckers (High Seas Trilogy). Jackdaw in the game Assassin's Creed IV: Black Flag. Jolly Roger, a pirate ship of Captain Hook from James M. Barrie's Peter Pan. Lightning in Joseph Conrad's The Rescue and the brig "Bonito" in Conrad's "Freya of the Seven Isles". Molly Swash, in James Fenimore Cooper’s book Jack Tier. Morrigan in the game Assassin's Creed Rogue, which was a brig-sloop. Porta Coeli and Amélie appear in the Horatio Hornblower series of books by C. S. Forester (later adapted to films and television). RattlesnakeThe 18-guner commanded by Commander Terence O'Brien in Frederick Marryat's Peter Simple. Sea Hawk in The Pirate of the Mediterranean by William Henry Giles Kingston. Seahawk in Avi's novel The True Confessions of Charlotte Doyle. Speedy a pirate ship from Jules Verne's The Mysterious Island. Triton in Ramage and the Freebooters and Governor Ramage R.N. by Dudley Pope. ^ "Section 705 - Title 37 - HISTORICAL AND MUSEUMS". www.legis.state.pa.us. ^ a b c "Sailing ships". Archived from the original on 2007-01-13. Retrieved 2007-01-12. ^ a b c d e R.M. Ballantyne. "Man on the Ocean". Archived from the original on 2006-10-11. Retrieved 2007-01-12. ^ a b "The Texas Navies" (PDF). Archived from the original (PDF) on 2012-04-25. Retrieved 2007-01-12. ^ "Colin Mudie". tallshipstock.com. Retrieved 2017-02-25. ^ "The Little Brig Sailing Trust - Sail with Us". www.littlebrig.org. Retrieved 2017-02-25. 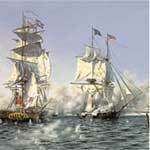 ^ "Brig or Brigantine". Archived from the original on 2007-09-12. Retrieved 2007-01-13. ^ a b c "The "Stockholm Brig" Tre Kronor". Retrieved 2007-01-12. ^ "Brig". Archived from the original on 2006-12-30. Retrieved 2007-01-12. ^ "American Memory from the Library of Congress". memory.loc.gov. ^ "The "Stockholm Brig" Tre Kronor Homepage". Retrieved 2008-06-17. ^ "Tall Ships Youth Trust". 26 June 2007. Archived from the original on 26 June 2007. ^ Stielau, Alexander. "Mitsegeln auf der Roald Amundsen : Homepage". www.sailtraining.de. ^ "The Little Brig Sailing Trust - About us". www.littlebrig.org. Retrieved 2017-02-25. Look up brig in Wiktionary, the free dictionary. Wikimedia Commons has media related to Brigs. A ketch is a two-masted sailing craft whose mainmast is taller than the mizzen mast. The name "ketch" is derived from "catch" or fishing boat. A brigantine is a two-masted sailing vessel with a fully square rigged foremast and at least two sails on the main mast: a square topsail and a gaff sail mainsail. The main mast is the second and taller of the two masts. Gaff rig is a sailing rig in which the sail is four-cornered, fore-and-aft rigged, controlled at its peak and, usually, its entire head by a spar (pole) called the gaff. Because of the size and shape of the sail, a gaff rig will have running backstays rather than permanent backstays. A Bermuda rig, Bermudian rig, or Marconi rig is a configuration of mast and rigging for a type of sailboat and is the typical configuration for most modern sailboats. This configuration was developed in Bermuda in the 17th century; the term Marconi was a reference to the inventor of the radio, Guglielmo Marconi, because the wires that stabilize the mast of a Bermuda rig reminded observers of the wires on early radio masts at a time when both were newly introduced. A trysail is a small triangular or square fore-and-aft rigged sail hoisted in place of a larger sail when winds are very high. The trysail provides enough thrust to maintain control of the ship. It is hoisted abaft the mainmast or, on a brig, abaft the foremast. The Cruizer class was an 18-gun class of brig-sloops of the Royal Navy. Brig-sloops were the same as ship-sloops except for their rigging. A ship-sloop was rigged with three masts whereas a brig-sloop was rigged as a brig with only a fore mast and a main mast. Amazing Grace is an 83' topsail schooner. Her home port is in San Juan, Puerto Rico. The ship serves as the platform for the non-profit Maritime Leadership and is also available for private charters and memorials at sea. Maritime Leadership provides traditional sail training adventures through sailings ranging from 3–48 hours.